ARE YOU INTERESTED IN A FUTURE BLACKTREE FARM BRED FOAL? Do you follow our horses and wish you could have one of similar quality & talent? Buying an In-Utero foal is the best way to get your own top quality youngster for a reasonable price! We have several talented mares available to choose from. Balance is due at weaning (4-6 months of age), at which time you can take your foal home! With your foal, you will receive any photos that we have taken of them growing up, including the birth (if we are lucky). Until they are ready to be weaned and come home, we will keep you updated about all the miracles of those first few precious months of life via email, photos posted on the website, and by phone. You are also welcome to come visit! 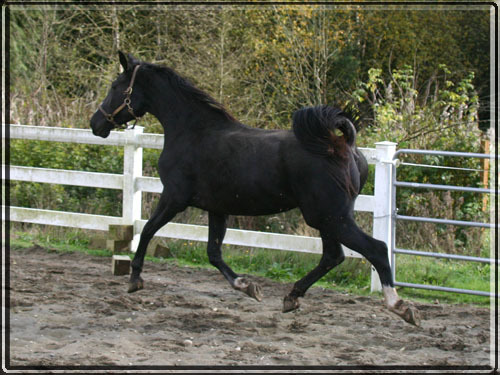 Wicca is a broodmare that has proven to produce exceptionally talented movers with sweet puppy dog-like personalities. She comes from impressive German dressage bloodlines, but all of her foals also love to jump. Registered and MMB Approved with Westfalen/RPSI. Previous Foals: Odin, Yukon, Aero and Brann. Stallion options: Belafonte D'Avalon (GRP), W. H. Top Gun (Connemara), Timolin (AES). * NOTE: WICCA will only be bred if an in-utero contract is in place before 7/1/19. Gracie is a uniquely striking mare with a Baroque style. Round, uphill and powerful, she looks like she stepped out of a fairy tale about Medival Knights. She has a huge, round jump, the sensibility of her Percheron dam and the sensitive/light responsiveness to the aids of her Andalusian sire. Everyone that rides her loves her. She wants to please and is very smooth and reliable both in the ring and on trails. * NOTE: GRACIE will only be bred if an in-utero contract is in place before 7/1/19. Ekko is a stylish young Thoroughbred mare with Irish and English bloodlines. She is a huge mover with a naturally round topline, a short back, well set neck and a lovely shoulder. She has placed well in every ring that we have put her in - dressage, hunters, jumpers and eventing. She exhibits all of the best qualities that Thoroughbreds are known to be able to bring into to the mix when breeding. Her 2018 KWPN filly, Tiā, is a fantastic example. 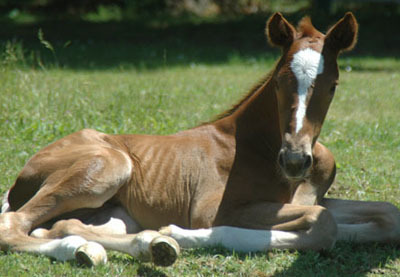 Previous Foals: Tiā. Stallion options: W. H. Top Gun (Connemara), Timolin (AES), Yeager GF. * NOTE: EKKO will only be bred if an in-utero contract is in place before 7/1/19. Tiā is combines the World class dressage bloodlines of Totilas (Gribaldi) with the famous jumping bloodlines of Landadel (HOL). Add in a bit of Irish and English TB from her dam, Ekko, and you have the perfect mix of movement, scope and stamina for the modern event horse. An amazing likeness to her talented sire, Timolin, we are excited to see what this filly produces when eventually crossed back to our German Warmblood stallion, Yeager GF. When she is 3, Tiā will be bred to: Yeager GF.